For those of us who neither think too much about the food we eat nor fetishize the tangled roots of their origins, be they tomatoes, onions, grapes or varieties of rice, a brief history of the ways a particular item has shaped (or been shaped by) people and events might not matter much. We absorb vegetables and fruit captured at the height of their nutritional value, no matter the season. We defrost frozen prepared foods as a simple means to an end, satisfied that the only consistency such meals can offer is reliability, if not flavor; they at least contain the staples for a seemingly nutritious meal. "…potatoes allowed rural Irish families to evade the discipline of wage labour by remaining self-sufficient." "Addressing the potato, the poet explains that 'you were not born a pure Spaniard, you are dark like my skin…' Praising the potato as 'the enemy of hunger,' …Neruda's ode celebrates its quiet modesty." In essence, as Earle points out in Chapter 2, the potato is the "…quintessential immigrant, arriving without fanfare…" She delineates potato types: White (Irish), Sweet (from the Americas), that differ from other tuber foods like the Jerusalem Artichoke. The potato was seen as an "earth-apple", and dismissed by wealthy Europeans for hundreds of years. Was this the result of classist rhetoric? Was it snobbery? The fact that they could be grown within the earth gave potatoes "…a degree of autonomy from taxation and control…They don't so much fly under the radar of the state, as grow, often underground, beneath its very nose." Basically, Earle seems to be arguing that the mere existence of the potato was a threat to commerce because of its resiliency and versatility; potato plants afforded independent farmers a greater chance at innovation, independence, and separation from the yoke of the state. The potato is like a stone. There are pleasures to be found in tending a potato garden. These are two arguments in Chapter Three. The potato certainly addresses the needs of a working-class population cheaply and effectively. When the United Nations Food and Agricultural Association (FOA) launched the "Year of the Potato" in 2008, it argued that "the potato should be a major component in strategies aimed at providing nutritious food for the poor and hungry." Earle argues that it's possible that the resilience and abundance of the potato could be credited with an increased population in the 16th through 19th centuries. The entanglements become even more incendiary when considering Oliver Cromwell. Earle argues that Cromwell saw the potato as a major impediment to preventing him from fully implementing his goal to "…convert the recently colonized Irish into a productive source of revenue for England." In other words, if they could grow and consume the potato on their own, the Irish could become an independent people. The story of the potato and economics becomes even more interesting when Earle writes about Chinese culture and potatoes. China, she writes, is "…now the world's leading producer of potatoes…" From China's Green Revolution of the '60s to today, especially with the classic commercial propaganda of "The Happy Potato Family" (a smiling Chinese woman walking hand-in-hand with anthropomorphized potatoes), the woman in the advertising campaign (known as "Sister Potato") represented "…the ongoing effort to associate potatoes not with dutiful submission to state demands or dire hunger, but with personal wealth." No matter the land or people, potatoes were equally adept at serving and ruling the social needs of their time. In Chapter 4, "Pleasure and Responsibility", Earle notes how economist Adam Smith saw potatoes eaten "…by 'the strongest men and the most beautiful women in Britain,' who turn out, rather surprisingly, to be Irish labourers and politicians." For Smith, a flourishing economy coincided with a greater consumption of potatoes. Did one necessarily influence the other? 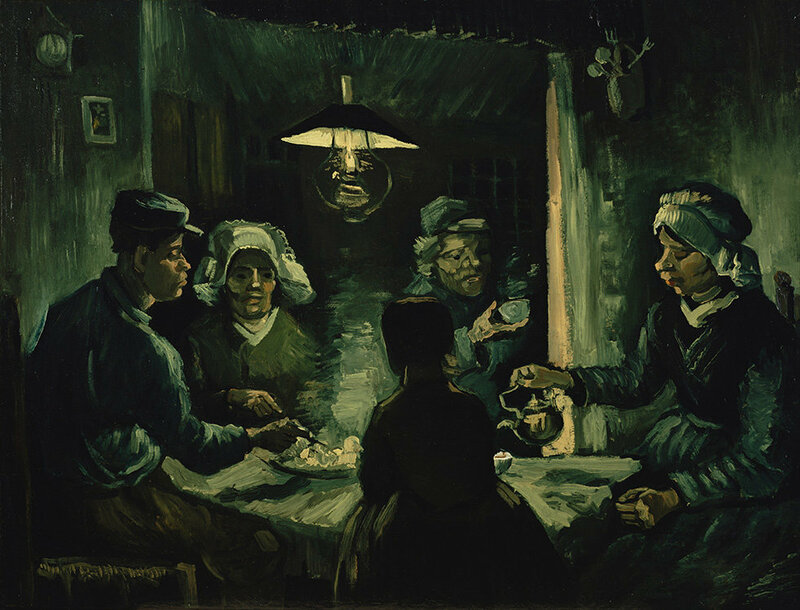 There's a beautiful section in this chapter on Vincent Van Gogh's classic painting Potato Eaters (De Aardappeleters, 1885). Of course, while we see the beauty in Van Gogh's painting (reproduced here in black and white), we can also sense the unsettled nature of the characters. Vah Gogh certainly succeeded in giving us a family of five people who had "… 'tilled the earth themselves with…honestly earned food…" That he insists he has rendered "civilized people" in this portrait is not easily dismissed. Still, Earle makes sure we understand the desperation in this painting. They are beautiful and civilized and they "…have no option but to eat potatoes." Van Gogh knows this, and Earle respects the artist and his message by emphasizing the desperation and dignity underlying such a beautiful family portrait. "The earthy potato provides a still centre point in the maelstrom of history that spins around Pierre… the consolation of small things… humanity itself. Munching his potato, Pierre muses that he has never tasted anything better in his life." There are no immense or profound truths to be found in Potato. Earle might have served the story better had she gone deeper into the socio-political history of the potato in Ireland and China. The Object Lessons series works best when it can bring a new spin on an object usually taken for granted in our lives; it has always there, it has always been a part of, in this case, the universal dinner table. It's a series whose brief volumes live and die based on the vibrance of their telling. 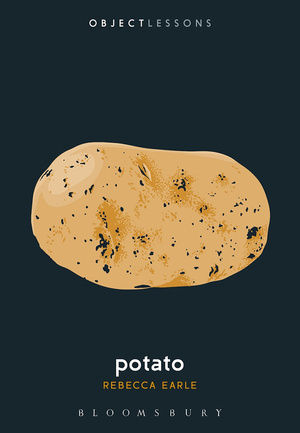 In comparison with other books in the series, Potato is less consistently interesting and more a valuable examination of a plant that's offered immeasurable strength and sustenance to generations, across the ages, and will probably continue to well into the future.